Back to happier topics. Getting teen haircuts today along with a trip to the everfabulous, Trader Ks for some "Snow Ball" attire. Trader K is a consignment store and what with the happily charging Cornell students, there are no end to garments still with the tags or worn once. Kitty's delight is the entire basement is filled with prom and formal dresses and shoes that she and her friends use as their dressup spot...and place to buy a formal dress for $20., look like a million and not have your mom stress over where the next meal is coming from. Who knows how Alex is going to deal...but maybe there will be that perfect crushed velvet or plaid suit to sport. It should be fun. I hope I can be patient. Sailor Valentines are a type of antique souvenir, or sentimental gift originally brought home from a sailor's voyage at sea for his loved one during the early 1800s. 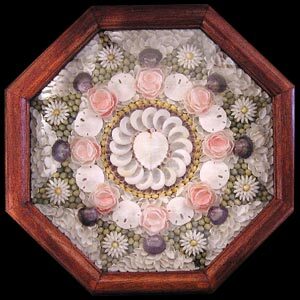 Sailor Valentines are octagonal, glass fronted, hinged wooden boxes ranging from 8" to 15" in width, displaying intricate symmetrical designs composed entirely of small sea shells of various colors glued onto a backing. Traditional shell designs often feature a centerpiece such as a compass rose or a heart design, and in some cases the small shells are used to spell out a sentimental message. Although the name seems to suggest that the sailors themselves made these objects, a large number of Sailors' Valentines originated in the island of Barbados, which was an important seaport during this period. Historians believe that the women on Barbados made the Sailors' Valentines with local shells, or in some cases with shells which had been brought to Barbados from Indonesia, and then the finished products were sold to the sailors. It has been concluded by John Fondas in his Book Sailors' Valentines, that the primary source for Sailors' Valentines was The Old Curiosity Shop, located in Barbados, and a popular place in the 1800s for sailors to purchase souvenirs. John's research tells of a sailors' valentine reconstruction, where the reconstructing artist found pieces of a Barbados newspaper inside the backing. 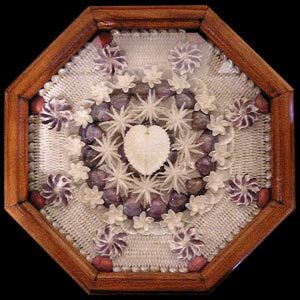 Today, antique "Sailor's Valentines" are once again in demand for their beauty and unusual qualities. Interest has sparked a resurgence in this art form. Many Sailors' Valentines, both new and old, can be found on the Island of Nantucket, Massachusetts. The Baileys-Matthew Shell Museum  has an extensive online exhibit of this art form. Plus, with Murray's suggestion of how creatures help an image--I am actively reading the Audubon Guide to North American Insects with great happiness and planning. Hello bugs. Also drew a miserable frog yesterday but see how he is so inviting, I will need to get him more right before prime time. Off to the frozen cold, beauty and hair and of course, Prom dresses.